The spectacular and expeditious ousting of Mubarak and Ben-Ali from their long-held positions of power left many scrambling for a convenient interpretation. What largely emerged however were hastily constructed narratives designed more to confirm their authors’ convictions than to reveal meaning. It didn’t take long for those accounts to be rattled when the subsequent uprisings did not adhere to the neat model observed in Egypt and Tunisia. Libya’s uprising was the first to deviate from the script, followed by Bahrain, Yemen and lastly Syria. As we encounter complex situations threatening extended periods of instability, it's time to dispel some of the lingering myths about the uprisings. Much has been said about the uprisings representing an Arab awakening, but this ignores that fact that the uprisings have been effectively limited to six countries so far. It is important to recognise that while there is a broader Arab dimension, the uprisings are still inherently bound with the dynamics inside their own countries. Furthermore, the idea of an ‘awakening’ implies that the Arab masses have been dormant for decades, ignoring the various challenges to the regimes in Iraq, Syria, Egypt, Algeria and many others, most of which were put down harshly in the past. What really changed is not the political consciousness of the populace, but the nature of the regimes which have experienced the erosion of their authority and a parallel loss of legitimacy. In many ways, we are witnessing the collapse of the authoritarian Arab regimes allowing the population to make a bid to destabilise them. This is specifically applicable to the Arab republics that built their legitimacy on different bases to those of the oil states. Nevertheless, it is not hard to see that this is the beginning of the end of this era in Arab politics. The R-word was brandished about generously after Ben-Ali’s and Mubarak’s unceremonious exits. While those were certainly great achievements by any standard, the role that the army played in both instances was crucial and ultimately aimed at sacrificing the ageing face of the regime in order to contain the uprisings. In both countries, the army didn’t hesitate to use force to halt any further demonstrations, quickly allying itself with conservative political groups that wanted a quick return to normalcy. Those emerging alliances have every interest in preventing a revolution that would radically transform society. The story in both countries is far from over of course, as new political dynamics are created in response to different aspirations stemming from below. But for the time being it appears that the revolutionary tide seems to have been successfully contained. ‘Organic’ uprisings are a recent phenomenon, despite attempts to link the colour-coded revolutions such as those of Ukraine and Georgia with earlier examples going as far back as the Indian independence movement. It is not hard to understand why they appeal to people considering the broad disenchantment with politics today, but they ultimately lack a solid basis that could introduce radical political change. (Ukraine and Georgia are good examples.) The urge to see the Arab uprisings as leaderless ignored the fact that success was more likely in the countries that had more advanced forms of organisation, such as Egypt and Tunisia, where political parties, social movements and trade unions played significant roles in the uprisings. In Syria and Libya the lack of leadership has meant a slower pace in galvanising support. In Yemen it allowed other players with political aspirations to enter the fray and attempt to benefit from the efforts of the protest movement. The infatuation with the idea of organic movements has muddled our understanding of the uprisings. We’re inadvertently celebrating one of the most problematic aspects of the uprisings, and one that will make it harder for the uprisings to achieve their goals. The uprisings have been frequently portrayed as existential struggles rather than as political conflicts. Some have even claimed that they are about restoring dignity and not projecting aspirations for freedom and democracy. The desire to see the uprisings in these a-political terms reflects the lack of credibility of traditional political movements, but it ignores that the lack of a political vision means alliances constructed around the lowest common denominator. In some instances when established movements joined the uprisings they were regarded suspiciously, as if their aspirations are not legitimate. In particular, many considered the involvement of Islamic parties as dangerous, forgetting that they have been for a long time vehicles for the expression of discontent. If there is a genuine secular alternative to be developed, it cannot rely on vague generalities but on a clear political aims that should address social and economic issues. For example, the debate about the economy in Egypt in the last few months has highlighted the glaring lack of any genuine ideas about how to take the country forward. If the uprisings are to have a real impact they should rely on political vision not on its absence. The peaceful nature of the uprisings in Tunisia and Egypt was widely celebrated. When the Libyan uprising appeared to become an armed insurgency, there were recriminations in some quarters, with some casting aspersions about the rebels' real intentions. Similar thoughts are now being expressed about the Syrian uprising. Things have obviously changed since the Spanish civil war, when international volunteers joined up with the republicans to fight the fascists, there is now very little appetite for armed struggle. Some preferred to see ‘civilised’ demonstrators practising non-violence, even though this effectively meant that the only violence being practised was directed against them. Furthermore, this has ignored the extent to which Arab regimes enforced their authority through their monopoly on violence. Not challenging this monopoly means that the balance of power could not change. This doesn’t mean however that the uprisings should aim for military victories. In any such confrontation with the regime the chances of success are determined by dissension among the army ranks and neutralising its role, not by winning military confrontations against it. By the time the Libyan rebels were asking for a no-fly zone and western intervention, they had effectively lost that battle. Gaddafi had regrouped and the mass uprising in Tripoli failed to establish itself. It was then surprising to see the same voices that celebrated peaceful protests welcoming western military action. This particular shift represents how problematic non-violence is, reflecting the degradation in the perception of armed struggle. 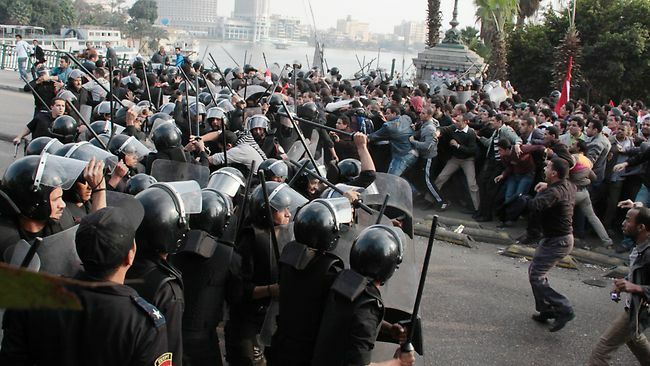 This is without a doubt one of the thorniest issues around the uprisings. The lack of appetite for armed uprisings gave way to enthusiasm for a no-fly zone and further military action in Libya. The clue behind this change was a shift in perception, the Libyan uprising was turned from a political conflict into a humanitarian crisis. While many are searching for hidden sinister motivations for the Western intervention in Libya, it was quite clear that liberal interventionism had been given a renewed sense of purpose. The intervention allows Western leaders to boost their moral standing by appearing to be acting in a moral fashion. This could be understood if we lived in some imaginary moral universe in which all the West’s actions were conducted in accordance with moral prescriptions, but hardly makes sense in the one we actually live in. Furthermore, it’s worth inquiring into the source of the West’s supposed moral responsibility: at the moment it seems purely substantiated on the basis of its superior military capabilities. This moral dimension is especially questionable given its role in propping up several of the Arab regimes for decades. But it would be erroneous to focus solely on military intervention. For several reasons, it doesn’t seem likely at the moment that the West would intervene militarily in Syria. But this hasn’t stopped calls for other types of intervention. Both the US and the EU have imposed sanctions on Syria, and there are repeated calls for president Obama to ask the Syrian President Bashar Al-Assad to step down. Obama’s hesitation over Syria is being portrayed as a form of moral cowardice, reflecting the extent to which the liberal appetite for intervention exceeds in many instances political administrations’ willingness. Consequently, a decision that should be firmly in the hands of the Syrian people and that they are paying a heavy price to acquire, the choice of their leaders, is being handed over to external authorities. Of all the misconceptions about the Arab uprisings, this is the most dangerous. The legitimacy and success of a popular uprising should not be tied to external agents, but to the people themselves. While it might seem cold-hearted to argue for that while demonstrations are being violently suppressed, it’s worth remembering that the uprising is a risk that people are taking while fully aware of the consequences. By intervening, we are ultimately taking away a right that the people are trying to acquire for themselves of their own will. If there's a common theme among the myths about the Arab uprisings it's the sense that they are fragile revolutions. To many observers and, sometimes, the people themselves, the uprisings appear to constantly face the risk of failure and appropriation by counter-revolutionary forces. This anxiety is prescribing limitations to what the uprisings can achieve and the extent to which they could prevail independently. Revolution is being transformed from an act of self-determination into a laudable yet feeble effort that needs external support. This perception reflects the lack of faith in the idea of revolution itself and appears to be a central paradox of the Arab uprisings.